When I was at Horseman's Outlet in March I noticed this little impulse item at the checkout. Yes, I bought it, and I've worn it daily. I love watching it change colors when the weather is chilly. The colors are nice, from amber to green to indigo. Did I mention it matches my new clogs? hahaha!! I got that ring last year! I also love to wear it and watch the colors change! Not in my book, obviously! I have one of those! I love it. 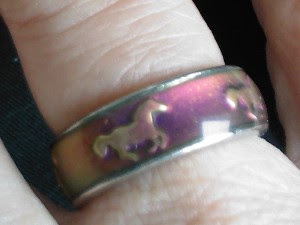 I love mood rings. I haven't seen the horse one but they sure have come a long way from the oval stone from my childhood. I'll also admit to purchasing others over the years. Enjoy! That is so cute!!! 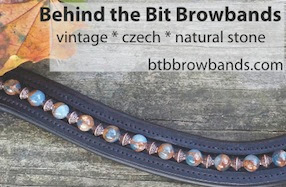 Another AWESOME jeweler/accessory company is Lilo...they make amazing bracelets, belts, key rings...I just profiled them on my blog yesterday. I only have a horsey key ring from them but want to collect MORE!!!! 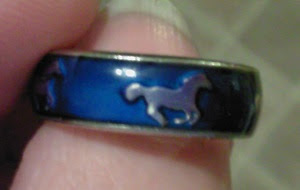 Love horse jewelry!